After establishing himself with a series of optimistically bittersweet films that have earned him award recognition, Jason Reitman has moved further into the cynical side of storytelling, tapping into adult themes through some uncomfortable methods. Young Adult marks the beginning of this phase for Reitman, in which he reteamed with Juno screenwriter Diablo Cody and actress Charlize Theron for a harsh coming-of-age tale of a boozy late-thirties divorcee revisiting her high-school period, building into a caustic glimpse at misguided attempts to reclaim the missed opportunities and desires of her youth. After this darkly humorous turn and the others that followed, recently capped off with a miserably overt takedown of internet addiction with Men, Woman, and Children, Reitman has once again paired up with Cody and Theron for what could've been the mother of all depressing character studies: Tully, a portrait of the psychology of strained, multiple-child motherhood. While melancholy in theme and tempo, Reitman also grasps the drama's positivity in creation of something both incisive and deeply satisfying. Marlo (Theron) and Drew (yet another endearing character turnout from Ron Livingston) are struggling parents of two, complicated by their son Jonah's development disorder that occupies a lot of their attention … and they have a third, unplanned child on the way any time now. Sensing her strain, Marlo's brother Craig decides to give them a special gift for the birth of their third child: hiring a "night nanny", a professional whose care takes place after hours so that the parents can get rest and attempt to function normally during the daytime. Marlo remains reluctant at first, but after the draining period following the birth, she's not so hesitant when a young, free-spirited woman -- Tully -- shows up on her doorstep and offers to come in for duty. As Tully enmeshes with the family dynamic, a relationship forms between she and Marlo as the exhausted mother surrenders to the aid that she offers. Tully proves she isn't just there for the newborn, though, as she opens the door for Marlo to rediscover some of the personality that she might've lost in her years of parenting. Inside the warm, dim space of the household, strikingly captured by cinematographer Eric Steelberg to highlight the slow-boiling emotions of domesticity, Reitman whips together a portrayal of a family already strung out by challenges … and how bringing a new child into the mix spreads Marlo too thin. There's honesty and conscientiousness in this depiction of how the mother copes with her special-needs child, from managing his symptoms in everyday scenarios to navigating meetings with his school's administrator, which then transitions to the raw, unglamorous components of new motherhood. Quick cuts throughout the initial parenting process create this beautiful sympathy-earning portrait of chaos and frustration, gracefully toeing the line between exaggerated cinematic drama and the day-to-day perils of living with a newborn. Marlo's demanding conditions form into a comprehensive portrait that gets the maddening and exhausting points across, which inform her flawed but well-intended responses. Ever since her performance in The Devil's Advocate, Charlize Theron has portrayed a range of layered characters who struggle with progressive internal suffering, with her emotional, guard-lowered gazes doing a lot of the heavy lifting as her body language conveys both resistance and exhaustion. This, of course, works wonders for bringing Marlo to life in Tully, though as she's done in other roles that tap into this sort of strained mentality, Theron also brings a distinctive attitude to the strung-out mother. At first, both Cody's writing and the direction avoid clear-cut explanations of who Marlo once was and how she's transformed into this increasingly cynical, yet loving and devoted persona, though subtle hints arise in conversations with her brother -- a reliably sarcastic yet likable and genuine Mark Duplass -- about her pre-parent attitude and problems encountered in earlier pregnancies. Through both raw physical displays of maternity and honest emotive outbursts, Theron's sincere portrayal invites those watching to experience what she's enduring and decipher what kind of person might be trapped under the surface. Once the night nanny shows up at the doorstep reporting for duty, the tone of Tully shifts into a balance between suspiciousness and an exhale of relief, showcasing how this new element impacts their happiness levels by working into facets of the family's day-to-day activity. The script from Diablo Cody does fire off a little of that overt wordsmith dialogue found in her earlier screenplays -- such as Marlo comparing herself to a trash boat -- but it's not of the same tempo as Juno and Jennifer's Body, employing a deft, mature touch in how she approaches the psychology of motherhood. The ways she allows Tully to take over certain aspects of her life expresses a bit about the balance between being a good parent and learning how to both let go and accept help from others, deepened by Mackenzie Davis' embodiment of a free-spirited intellect as the nanny. Davis supports the film's credibility during moments when the burdened mother easily opens up about her frustrations, desires, and past, turning what could've been too-quick development into an intriguing, resonant progression of their chemistry. Throughout most of Tully, the script from Diablo Cody revolves around the surface-level demands thrust upon Marlo, working its way toward themes involving the depression that can stem from post-partum issues as well as from the exhaustion of caring for multiple kids … and neglecting one's well-being. While this might sound overly somber in the same vein as the director's other recent work, Reitman succeeds in developing a sympathetic character drama that toes the line between melancholy and uplifting tones, slipping in rays of triumph and positivity as the night nanny's presence takes effect. 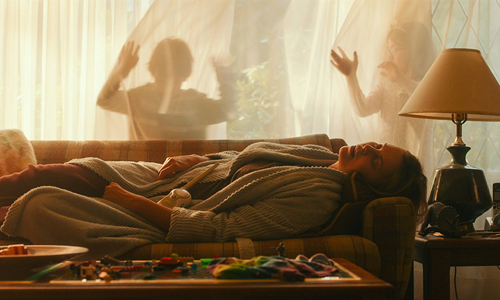 Tully doesn't stop there, though, as Diablo Cody dusts off well-worn devices from the realm of psychological drama and works them into her earnest depiction of the maternal mindset. What was already a compelling, evenhanded character drama about parenting and identity grows, through its culmination of ideas at the end, into a meaningful realization of conceptual plotting that deals with things that aren't in any way beyond its maturity level.